This is going to be a shorter review than you’d normally see on this website, because quite frankly there’s not a lot I have to say about this movie. I know next to nothing about the Anton Chekov play it is based on, other than it’s considered to be a theatre classic by many and that it’s apparently quite difficult to adapt for the screen, nor have I seen any stage productions of it or even any other film adaptation in the past, so not only can I really critique it as an adaptation, but I can’t even compare it to how it has been shown on screen before. You can call me an uncultured swine for not being more in tune with playwrights like Chekov, but I really wouldn’t be able to add anything to the conversation that so many people over the years have managed to do with this one. What I can say with any real sense of what I’m writing about is that this film, purely on its own merits, is a serviceable but ultimately unremarkable costume drama with some very soapy plotlines and lengthy stage-friendly dialogue acted out by a talented cast who just seem happy to be there performing this material. The plot, as best as I can pick up, is set in early 20th century Russia, at a remote villa in the countryside where aging actress Irina (Annette Bening) is staying for the summer with her latest squeeze, famed writer Boris (Corey Stoll). Irina is part of a quietly dysfunctional family unit, which includes her ill brother Sorin (Brian Dennehy) who owns the villa, the lovestruck Masha (Elisabeth Moss) and her temperamental and insecure son Konstantin (Billy Howle), who aspires to become a playwright but whose attempts at showing his work are cruelly dismissed by his vain and superfluous mother. Amidst the family drama, local country girl Nina (Saoirse Ronan), who is Konstantin’s lover, comes into the picture and quickly falls for Boris. It’s important to reiterate that I am not an expert in all things Chekov, so any plot and character details that I am missing here are largely due to how I really don’t know much about this particular play, other than being told by many people that it’s a classic piece of stage work. Watching this film, it’s easy to pick up on its theatrical origins, from the lengthy monologues that characters perform to the limited locations in which it is set, and I get the feeling that were I to watch a more straightforward production of this on the stage, I would feel a bit more comfortable than watching what feels like a slimmed-down version on the screen. Here, most of the dialogue and even entire characters feel like they’ve been trimmed down to the utmost basics – though for all I know, that’s exactly how this play was written in the first place – and there’s not a whole lot left to chew on because you get the sense that what made most of these people interesting on paper is barely present in this iteration of the text. While the acting is all around decent, despite every single one of them (including the Brits in the cast) adopting an American accent – ranging from authentic to distractingly fake – to play these Russian characters, some of them are saddled with characters who take more time than others to really get used to, particularly Annette Bening and Billy Howle as mother and son respectively. The former is enormously vain, an attention-seeker who comes across more often than not as a self-absorbed monster than someone with a sense of compassion; the latter, meanwhile, is not that far removed from his parentage, as he too can often come across as a whiny, spoiled and irritatingly pretentious fop whose arrogance is matched by his deep insecurity that makes him not a very appealing character. On the opposite end of the spectrum, you have Saoirse Ronan and Corey Stoll – who are easily the best parts of this movie – who could both do so much better than being with these two monstrous figures as their respective partners, yet according to Chekov’s text they’re here in this rather unpleasant situation with them. Look, there’s really not much else I can be bothered to say about this; it’s not a badly-made film, aside from one or two strange editing choices, and like I said the actors all do their best with what is undoubtedly some very classy material, but seeing how this is the very first incarnation I’ve seen of this play being performed, I feel like I should have saved my first Chekov experience for the stage where it belongs, instead of this serviceable but completely forgettable costume drama that left almost no impact on me. 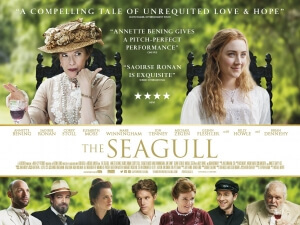 The Seagull will probably please Chekov purists, but newcomers will struggle to get as invested in the material.